Listen up, because this story could have serious consequences for you or someone you love: If your head has been stuck in a Bugles vending machine for more than 10 years, you may be entitled to a free pack of Bugles thanks to a class action lawsuit. This is about justice, plain and simple. If you’ve dealt with pain and suffering as a result of living with your head stuck in a Bugles machine, this ruling will hopefully mitigate some of your hurt. 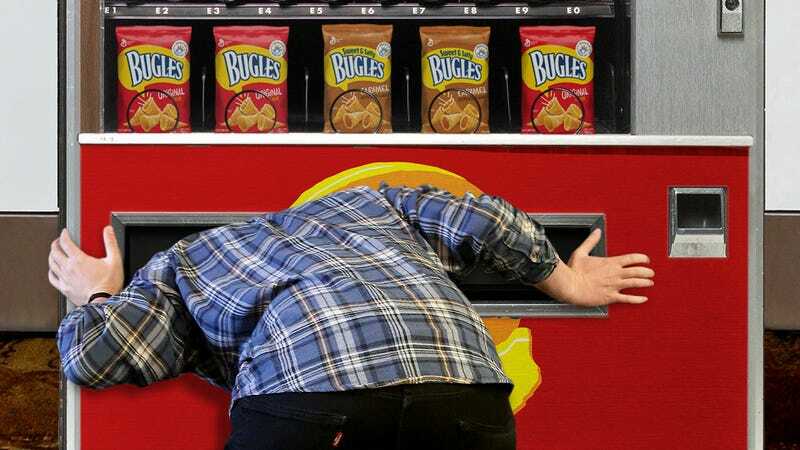 General Mills, the company that manufactures Bugles, has come under fire recently from a group that identifies itself as “The Vending Machine Crew”—hundreds of individuals whose heads are all trapped inside of full-service vending machines. Each of their stories are different—one single mom put her head up the machine to retrieve a stuck pack of Bugles for her son, while one young man got trapped in an attempt to get a closer look at the Bugles’ weight in ounces as described on the front of the bag—but together, they’ve managed to win justice for people stuck in Bugles vending machines worldwide. “After over 10 years of missing football games, dance recitals, work, and school because we can’t extricate ourselves from these enormous Bugles snack apparatuses no matter how much we flail our limbs, we came together to take our story to court and demand compensation,” said the group’s leader, a teacher with his head shoved all the way under the bottom flap of a vending machine. So, if you fit the description of someone who has had their head stuck in a Bugles vending machine for 10-plus years, it’s time to claim the reward to which you are entitled! Justice is served!